Most warehouses that I have worked with are challenged to store a wide variety of SKUs, all with different case sizing, pallet heights and weights. Not too many warehouses have the luxury of dealing with one standard size. Because of this situation, warehouse managers must take the time to configure their racking to accommodate different pallet heights or alternatively create a standard pallet height. This will provide for improved space optimization. Many warehouses have the spacing (or elevation) of their racking set up to accommodate an average pallet height (or even worse to accommodate the tallest pallet heights). One standard pallet height would make life so much easier, but as all warehouse managers know, that situation rarely exists. The warehouse manager is tasked with storing product with different heights. 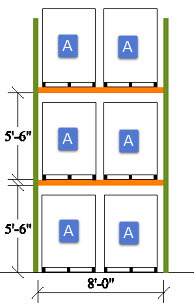 The challenge of course is to find the best storage fit for all the inventory sizes. There are two solutions for this challenge. 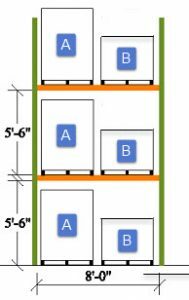 One is to create a standard pallet height and the other is to adjust the racking to elevations that match up with the different pallet heights. There are CAPE Pack Palletizing Software products that allow companies to create standardized pallet patterns and heights. When a company is the manufacturer of the products that are being distributed, this is the recommended solution. 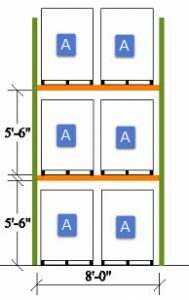 All SKUs should have standard case patterns and pallet height. When the warehouse is a wholesaler or distributor, having standard heights is more difficult. Therefore the warehouse will have to create a variety of storage configurations. This can be achieved by reviewing the Item Product Master listing. Most Product Masters have case dimensions and cases per pallet fields that should allow you to categorize the various pallet heights. If this information is unavailable, take the time to physical inventory the different pallet sizes that need to be stored. Use this information to create a variety of racking storage elevations. Slot the products accordingly and you will be amazed at the space savings in your warehouse.